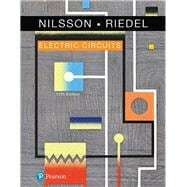 For courses in Introductory Circuit Analysis or Circuit Theory. The fundamental goals of the best-selling Electric Circuits remain unchanged. The 11th Edition continues to motivate students to build new ideas based on concepts previously presented, to develop problem-solving skills that rely on a solid conceptual foundation, and to introduce realistic engineering experiences that challenge students to develop the insights of a practicing engineer. The 11th Edition represents the most extensive revision since the 5th Edition with every sentence, paragraph, subsection, and chapter examined and oftentimes rewritten to improve clarity, readability, and pedagogy—without sacrificing the breadth and depth of coverage that Electric Circuits is known for. Dr. Susan Riedel draws on her classroom experience to introduce the Analysis Methods feature, which gives students a step-by-step problem-solving approach. Mastering™ is the teaching and learning platform that empowers you to reach every student. By combining trusted author content with digital tools developed to engage students and emulate the office-hour experience, Mastering personalizes learning and often improves results for each student. Note: You are purchasing a standalone product; Mastering Engineering does not come packaged with this content. Students, if interested in purchasing this title with Mastering Engineering, ask your instructor for the correct package ISBN and Course ID. Instructors, contact your Pearson representative for more information.